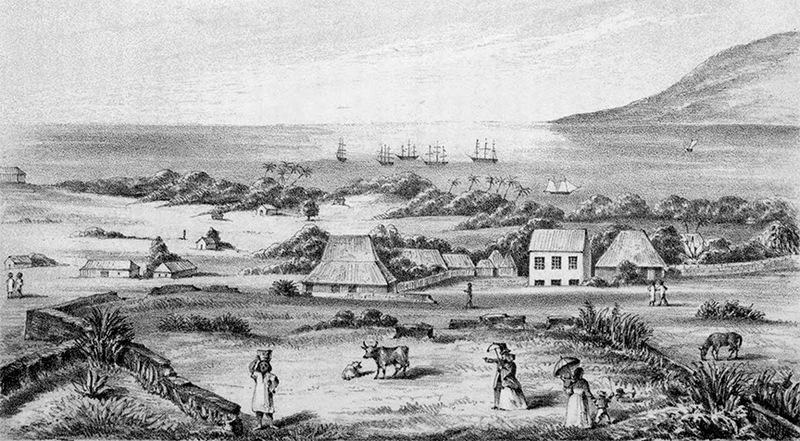 The first Constitution of the Kingdom of Hawaiʻi adopted in 1840 replaced the informal council of chiefs with a formal legislature of the Hawaiian Kingdom and cabinet. The Hawaiian government was a constitutional monarchy comprised of three branches: Executive (Monarch and Cabinet), Legislative (House of Nobles and Representatives) and Judicial (Supreme Court and lower courts). The King also had a private council – the Privy Council is distinguished from a modern cabinet of the executive; in the monarchical tradition, a Privy Council lent legislative powers to the monarch and served judicial functions. Under the leadership of King Kamehameha III, the Privy Council was authorized by the Act to Organize the Executive Ministries on October 29, 1845. The Kingdom of Hawai`i’s Privy Council was a body comprised of five ministers and the four governors along with other appointed members that served to advise the King. The cabinet consisted of a Privy Council (officially formed in 1845) and five powerful government ministers. Gerrit P Judd was appointed to the most powerful post of Minister of Finance; Lawyer John Ricord was Attorney General; Robert Crichton Wyllie was Minister of Foreign Affairs; William Richards Minister of Public Instruction and Keoni Ana was Minister of the Interior. The former council of chiefs became the House of Nobles, roughly modeled on the British House of Lords. Seven elected representatives would be the start of democratic government. The House of Nobles originally consisted of the king plus five women and ten men (women did not get the right to vote in the US until 1920). After the overthrow and the subsequent annexation, it was renamed the Senate. In planning the road, the words of the Privy Council’s resolution were taken literally, and the route selected ran to the high saddle between Mauna Kea and Mauna Loa on a practically straight line between the terminal points. When the road had been built about 12-miles from Kailua into the saddle between Hualālai and Mauna Loa, the project was abandoned – a pāhoehoe lava flow from the 11,000 foot-level of Mauna Loa crossed its path. Though incomplete (it never reached its final destination in Hilo,) people did use the Judd Road to get into Kona’s mauka countryside. This road was not the only attempt of linking East and West Hawaiʻi. About 100-years after the Privy Council’s resolution to connect East with West, the US military completed the link by building a vehicular access route to its Pōhakuloa Training Area during World War II. Like earlier roads in Hawaiʻi it was not originally designed to State highway standards. Surfacing and nominal repairs over the subsequent decades left a roadway that island rental car companies banned its customers from use. Saddle Road is the shortest and most direct route across the island of Hawai‘i, linking the historical main population centers of the island in East Hawai‘i with the growing West side, where the economy is anchored by tourism. 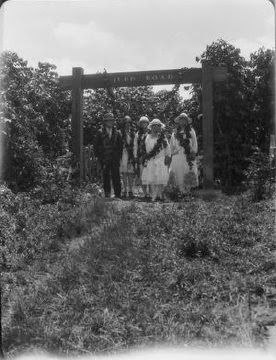 The image shows Judd Road (L-to-R: GP Wilder, Leilehua Judd Eldridge, Nora Swanzy Bennett, Julie Judd Swanzy, Haunani Judd Farley.) (Mission Houses) In addition, I have added other related images in a folder of like name in the Photos section on my Facebook and Google+ pages. William G Irwin was born in England in 1843; he was the son of James and Mary Irwin. His father, a paymaster in the ordnance department of the British army, sailed with his family for California with a cargo of merchandise immediately after the discovery of gold in 1849. The family then came to Hawaiʻi. Irwin attended Punahou School and as a young man was employed at different times by Aldrich, Walker & Co.; Lewers & Dickson; and Walker, Allen & Co. In 1880, he and Claus Spreckels formed the firm WG Irwin & Co; for many years it was the leading sugar agency in the kingdom and the one originally used by the West Maui Sugar Association. In 1884, the firm took over as agent for Olowalu Company. William G. Irwin and Claus Spreckels constituted the partnership in the firm, which maintained offices in Honolulu. The role of the agent had greatly expanded by this time. William G Irwin and Company acted as a sales agent for Olowalu’s sugar crop as previous agents had done. It also was purchasing agent for plantation equipment and supplies and represented Olowalu with the Hawaiian Board of Immigration to bring in immigrant laborers. In addition, Irwin and Company acted as an agent for the Spreckels-controlled Oceanic Steamship Company and required, for a time, that Olowalu’s sugar be shipped to the Spreckels-controlled Western Sugar Refinery in San Francisco by the Oceanic Line. In 1885, Irwin and Spreckels opened the bank of Claus Spreckels & Co., later incorporated under the name of Bank of Honolulu, Ltd., that later merged with the Bank of Bishop & Co. In 1886, Mr. Irwin married Mrs. Fannie Holladay. Their only child, Hélène Irwin, was married to industrialist Paul Fagan of San Francisco. A close friend of King Kalākaua, Irwin was decorated by the King and was a member of the Privy Council of Hawaiʻi in 1887. In 1896, the Legislature of the Republic of Hawaiʻi put Kapiʻolani Park and its management under the Honolulu Park Commission; William G Irwin was the first chair of the commission. In 1901 he was made a Chevalier of the Legion of Honor by the French government in recognition of his services as Hawaiʻi’s representative to the Paris Exposition. By 1909, William G Irwin and Company’s fortunes had declined and, reaching retirement age, Irwin reluctantly decided to close the business. In January 1910, the firm of William G. Irwin and Company merged with its former rival C. Brewer and Company. Irwin moved to San Francisco in 1909 and served as president and chairman of the board of the Mercantile Trust Company, which eventually merged with Wells Fargo Bank. In 1913, Mr. Irwin incorporated his estate in San Francisco under the name of the William G. Irwin Estate Co., which maintained large holdings in Hawaiian plantations. He had extensive business interests in California, as well as in Hawaiʻi, and was actively associated with the Mercantile National Bank of San Francisco in later years. William G Irwin died in San Francisco, January 28, 1914. 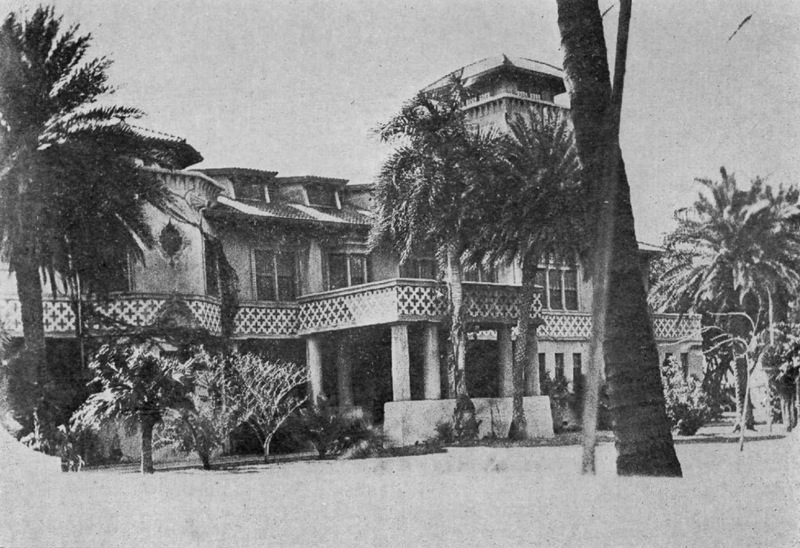 Irwin had a CW Dickey-designed home makai of Kapiʻolani Park. In 1921, the Territorial Legislature authorized the issuance of bonds for the construction, on the former Irwin property, of a memorial dedicated to the men and women of Hawaiʻi who served in World War I. It’s where the Waikīkī Natatorium War Memorial now sits. The project began in 1916 with the construction of new docks; it continued in 1924 with the construction of Aloha Tower as a gateway landmark heralding ship arrivals. The Honolulu Waterfront Development Project was completed in 1934 with the creation of a 2-acre oasis shaded by the canopies of monkeypod trees (shading a parking lot;) Irwin Memorial Park is located mauka of the Aloha Tower Marketplace bounded by North Nimitz Highway, Fort Street, Bishop Street and Aloha Tower Drive. The William G Irwin Charity Foundation was founded in 1919 by the will of his wife to support “charitable uses, including medical research and other scientific uses, designed to promote or improve the physical condition of mankind in the Hawaiian Islands or the State of California.” The 2010 Foundation report for the Foundation indicated its value at over $100-million. Among other activities, it funds the William G Irwin Professorship in Cardiovascular Medicine, which was created with gifts from the William G Irwin Charity Foundation of San Francisco, and, with a transfer of funds in 2003, the Hélène Irwin Fagan Chair in Cardiology at the Stanford School of Medicine. The image shows the Irwin home at what is now the Natatorium. In addition, I have included other related images in a folder of like name in the Photos section on my Facebook and Google+ pages.